Back in 2015, Jason Assad contacted me about writing a piece for the new magazine he was working on called Meta. At this point, I had never done anything for “traditional” print media, but I had been writing for several years on the web. Of course, I was flattered to be asked but also intimidated by the prospect of having to write something that was likely to be read by so many people. On top of that, he wanted me to write something about one of his personal friends, Mike Healy. At that point, Mike was well on the road to putting his life back together, but he remained a controversial figure due to the events that eventually led to his incarceration. At that point, I had never spoken to Mike, but we regularly corresponded on social media and I had always been a fan of his skill and style on the track. While I thought I could write an interesting piece, I was more than a little daunted by the prospect of trying to do his fascinating story justice within the extreme constraints of print media. Up until this point, I had never been constrained by things like a page or word count. On the web, your canvas is limitless and Steve Matthes had never asked me to limit my articles in any way. If I wanted to write 500 words then great, if I wanted to spill out 30,000 words on the history of Honda, then even better. With this project though, that was just not going to work. In print media, you are constrained by things like paper cost and advertising concerns. You only have so many pages, and you can have half of you magazine taken up by one article. Because of this, I really had to think hard about how to communicate in a new way. After laying out a plan and interviewing Mike, my initial draft for the article was just over 3500 words. It was focused mainly on Mike’s career and went into a lot more detail than the final product. Basically, it was similar to the long-form pieces I had done on Chad Reed and Kevin Windham for PulpMX. After I sent my first draft to Jason, Andrew Campo (the publisher of Meta) and Ben Giese (creative director at Meta), I received the first real editorial critique I had ever experienced since starting this writing thing. All three liked it but thought it was way too long and far too focused on ins-and-outs of his career. At this point, I had already spent dozens of hours on this and I have to admit, this was tough to hear. What I had delivered was what I was accustomed to doing, but that was just not what they were looking for. After having a minor meltdown to my wife, I set about trimming the fat and refocusing the narative. I exorcised most of the actual racing out of the piece and instead tried to pare things down to the emotional beats and inflection points in the story. After I was done, I had the word count down to a much more manageable 1500 words. In the end, I am very happy with how this turned out. I think it tells Mike’s story in a compelling way and really, that is all any author could hope for. The road to motocross stardom is a perilous one. It’s a journey that requires its participants to take chances that literally risk their lives every time they go out on the track. Unlike the stick and ball sports, there is no college scholarship to shoot for and no hope of a degree to fall back on. In motocross, it’s all or nothing and when you choose that path, there is seldom any plan B. For former mini prodigy and Grand Prix Motocross star Mike Healey, that “What’s next?” journey has been a complex and troubled one. Once one of the most promising young talents in motocross, Healey’s career saw him rise to the pinnacle of the sport, only to fall victim to drug addiction and despair. Bad decisions, run-ins with the law, and eventual incarceration turned out to be the footnotes to one of the most interesting motocross careers of the early nineties. Now, over a decade after the racing part of his journey ended, Mike is piecing his life back together and writing an act two. Mike’s act one started in the early seventies on the dry and dusty tracks of Southern California where he honed his skills racing as many as five days a week at iconic tracks like Carlsbad and Saddleback. There, he caught the attention of Rudy and Dean Dickenson, who moved him onto their fledgling R&D Suzuki amateur team. Riding for R&D, Mike was one of Suzuki’s premier mini talents of the late seventies and early eighties, delivering dozens of amateur titles to the brand. With his golden hair and surfer looks, Healey was the prototypical California motocross kid. Brash and blazing fast, he was fearless on the track and cocky off of it. 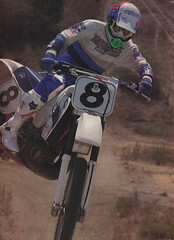 Riding for factory Suzuki, Mike made his pro debut in the inaugural running of the 125 supercross series in 1985. There, he proved his speed by reeling off victories in two of the first three rounds, only to suffer heartbreak right before the finale. After the heartbreak of 1985, Mike was dealt another blow by the AMA in 1986. With his two wins in ’85, Healey was informed he had pointed out of the 125 class. Barely a month past his seventeenth birthday, Mike was already being moved into the premier division to do battle with the likes of legends like Jeff Ward and Ricky Johnson. Confident or not, that was a lot to ask of a kid barely out of puberty. After surviving his first season in the premier class, Mike was excited to get back on the 125 for outdoors, but things would not go as planned. Midway through the series, he showed up at the track with a blue Mohawk, a souvenir from one of his many club outings. Mike didn’t give his avant-grade appearance much thought, but the powers that be at Suzuki were rattled and delivered an ultimatum, lose the hair, or lose the ride. At this point, Mike made one of those fateful decisions that are the hallmarks of youth. Brimming with nearly limitless self-confidence and the general lack of respect for authority that goes with too much testosterone and not enough thought, Mike decided to forgo a date with the barber and show up at the next round with the mohawk intact. Faced with this insubordination, Suzuki fired him on the spot. Throughout the following years, Healey’s career would be filled with endless hurdles, bad luck, injuries and relentless adversity. Eventually, Mike would throw in the towel and make the decision to try something new. For the next decade, Mike made a nice niche for himself as a teacher and part-time racer, but underneath, trouble brewed. The lifestyle of a motocross racer is one of constant injury and recovery, and that wear and tear started to catch up with Healey. Faced with chronic pain, Mike began using narcotics to ease his discomfort. Eventually, he ran out of prescriptions, but not out of craving. Over time, Vicodin transitioned to illegal alternatives like heroin and meth. As the addiction consumed him, the rest of his life literally fell apart. The first casualty would be his marriage; the second, his freedom. As things spiraled out of control, Mike became more and more withdrawn. Junkies replaced his friends and stealing became his new way of life. In 2009, this new lifestyle finally caught up with the old one, as word got out that Mike had been arrested for mugging an old lady for drug money. Immediately, motocross message boards exploded with questions, outrage and downright disbelief. “How could this happen?” many asked, but just as many knew Mike’s story was far from unique. In a sport comprised of adrenalin junkies and built on the premise that pushing through pain is a required part of the experience, drug addiction turns out to be an all too common occurrence. Now, almost seven years removed from that low point, and fifteen months since being released on parole, Mike is focusing on staying clean and starting a new life as different from motocross as can be imagined. A year and six days later, Mike graduated from Paul Mitchell with a new career and a fresh passion. Mike Healey: mini prodigy, Grand Prix star, and professional stylist. Once a cocky kid with a world of talent, now a humble man with a world of life experience, he is taking on the next stage of his journey with the same drive and focus that got him to the top in one of the toughest sports in the world. For him, like so many others, “What’s next?” turned out to be a longer, harder race than anything on the track. Act twos, like championships, are rarely easy, but few things in life worth having are.